I am a traveler in an antique land and today we looked upon some works; but there was no despairing. We traveled south from Giza to visit Memphis and Saqqara. The trip itself was probably as much an education as the destination. We were driving through progressively smaller and poorer suburbs and villages. Everywhere you looked you’d see dust-covered people standing by the road, or riding on donkeys or camels, or farming by hand, or carrying loads on their heads, or tending a stall selling three cauliflower heads. And absolutely everywhere there were piles and drifts of rubbish. The relative poverty was one thing to see, but the squalor of living amidst so much rubbish was a much more forceful lesson in how lucky we are. 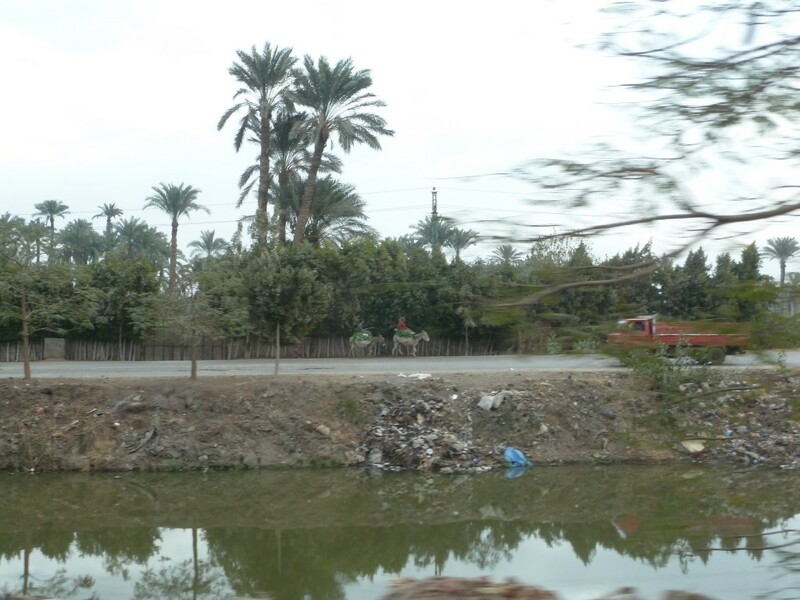 Most of the trip follows a fetid irrigation canal and I think the reality of the people we saw really hit the boys when they saw people fishing in its turgid brown waters. Memphis was the ancient, and by that I mean 5000 years ago, capital of Egypt. Today there are the scattered remains of sarcophagi and statutes to see. We learnt a few interesting things in Memphis – in particular that a statue with a straight beard depicts the subject alive, one with a curled beard depicts the subject after death. Having a walking stance also signals that they are depicted alive. Memphis has several statues of Ramases II which aptly demonstrate this in action. Memphis was also where we had a parent moment. You know one of those moments where you are caught between pride and embarrassment – or maybe they’re something peculiar to us. Anyway, we had a guide to tell us all about what we were seeing. All fine except that Callum had already told us all the same things and more; and then proceded to correct and amplify on the guide’s speil. The guide, it must be said, took it with the good grace of someone searching for a healthy tip. After Memphis came Saqqara which served as a necropolis to the Egyptian royalty for thousands of years. 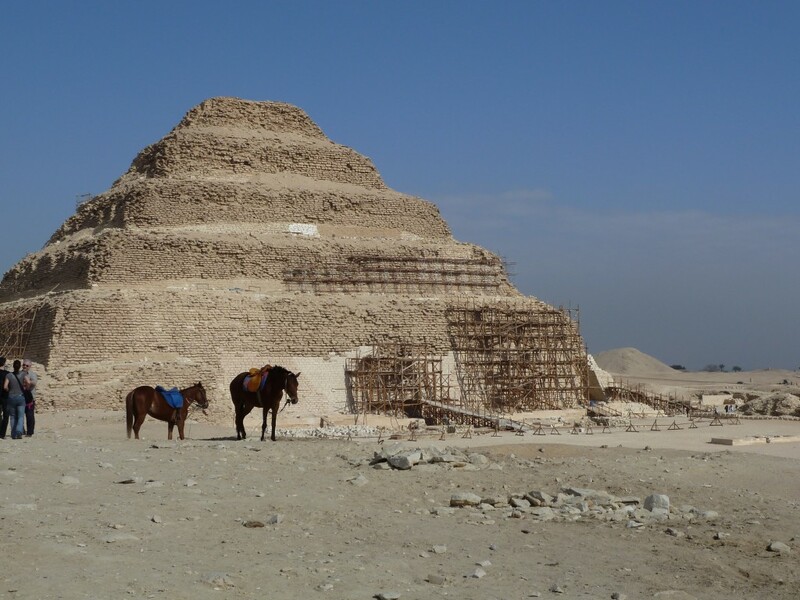 The most interesting thing is Djozer’s step pyramid – the first stone-built pyramid. It’s in remarkably good condition for something the best part of 5000 years old. While the pyramid was built to house Djozer’s body it was designed and engineered by, our new geek hero, Imhotep who appears to have been the DaVinci of his time. The first, recognised, architect, engineer and surgeon. He was so revered that he got made into a god after he died – which probably beats the Nobel Prize or any modern equivalent. Anyway there’s something about looking upon 5000-year old works that just generates unending awe in me. To have built something that has survived that long and it still marvelous to behold. To have managed to preserve their bodies for all that time. To have passed on their stories over millennia. The pharaohs may have been on the wrong track in terms of their motivation, but it’s hard to fault their implementation. And there, of course, is where Shelley went wrong. 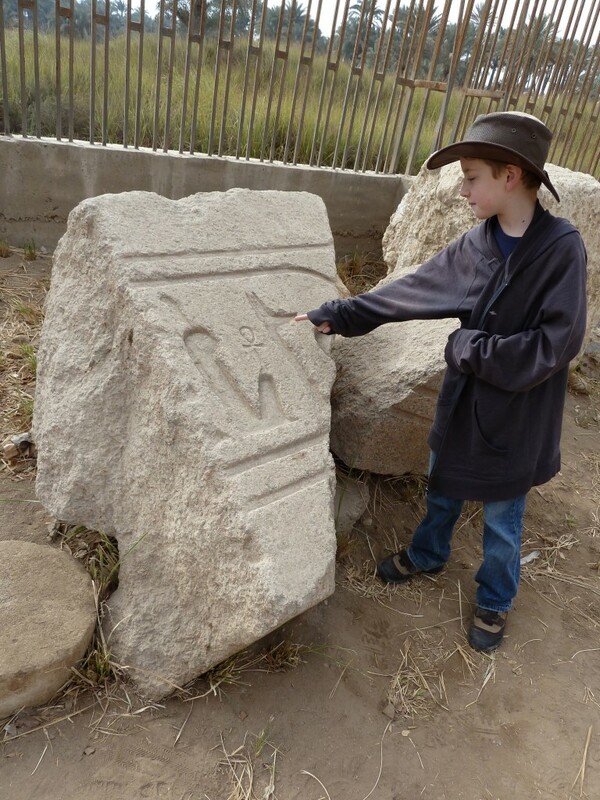 Ozymandias is in fact Ramases II – and Egypt is littered with stuff he left behind that is still going strong. Sadly, in Egypt today, the decay and despair all seems to be in the modern world.